Once placed, the cookie keeps a track on the search interests of the user and informs the same to a remarketing platform. Based on the products, topics or pages one shows interest in, the ads are customized and displayed when the user comes online. Remarketing involves strategic placement of cookies on the website visitor’s device(s). Their cookie ID forms a part of the remarketing audience list. You can devise a number of lists with a range of criteria. You can target visitors of a particular page or even those who did not make the purchase of a said item from your store. Each cookie bears an ID, which is added to the remarketing list. One can add a number of advertising controls based on impression caps, ads to be shown per day and even blocking of ads on some websites. You can manage the ads targeting by age, gender, location and other aspects of their behaviour. Google has now added more features for advertisers, allowing more flexibility through Google Analytics code upgrades. The lists can now be created and managed without specific website code required. Businesses can remarket a single product in different styles, based on audience preferences. This strategy can draw newer audiences while engaging existing ones. Brands can connect with their audience personally too. Standard Remarketing - This kind of remarketing includes showing ads to previous visitors. The ads are in the form of small videos or an ad copy. When using search engines like Google or social media like Facebook, we tend to browse from page to page without staying at one for a long time. The terms which the user types are targeted to send similar ads. Dynamic Remarketing - This remarketing strategy is customized for e-commerce sites. The ads in dynamic remarketing are displayed solely based on the interests of different customers. For example, some sites save the items which are not bought in the cart, which increases the chances of a user buying it when they chance upon the product and the website again. This strategy also lets the site send ads about discounts and offers. In this type of remarketing, the website can also extract information regarding the geography of the site of interest for the user since he or she spends more time in that region. 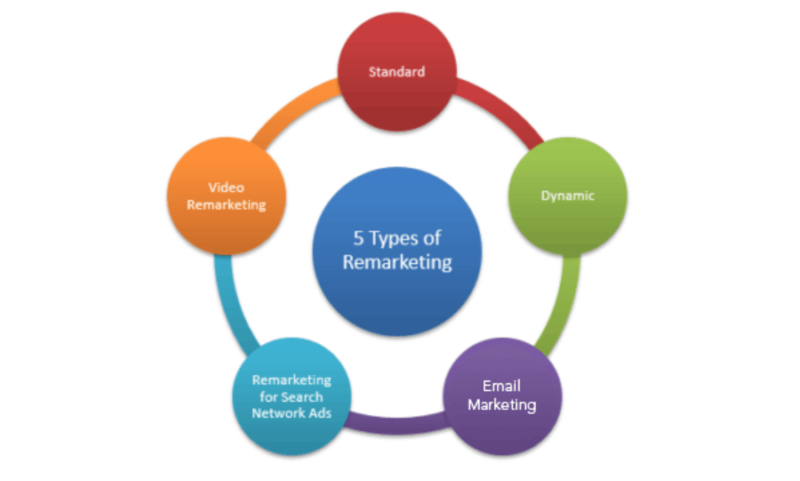 Video Remarketing - This is one of the most commonly found and successful methods of remarketing. If a user visits a page, then the video ads from that page can be seen by the user. This can happen at the beginning of or in between the video that is being watched. They are usually attractive clips that are to-the-point and have crisp content. Email Remarketing - This kind of marketing revolves around 2 styles of approach. Often users give their information but do not complete the purchase. In such instances, their mail id’s can be used to remind them of the products that were left off. The emails can also be used to convince the buyer about the price and how genuine the product is. This can persuade users into buying products. Remarketing Lists for Search Ads - offered by Google Adwords, it lets you put forward your ads while the user is searching in other websites or search engines. This can happen only if the user visits your site first and then looks elsewhere. The strategies for such ads are, specific visitors can be targeted based on when they last visited your website. People who have recently checked for products or have spent time in the pricing or comments section can be targeted more for ads. This is because they are more likely to buy the products. This can be done by bidding on specific keywords. Another method is by bidding on more random keywords to target the users who do not visit the website on a regular basis. This helps to attract them back to the website and also increase the popularity of a brand. Targeting Narrow Audiences - General marketing is a broader style of reaching out to potential buyers. Remarketing is a more specific approach that interacts with an audience that is more interested than not. Few actions on the website can have an installed tag which will show the seriousness of the buyer. There is a higher chance of recurring sales when a narrower audience is targeted. Improving Brand Name - People do not spend more than a few seconds to look at an advertisement. They should have a clear, interesting message that will get the attention of the user. Regular ads that display the name of your brand will slowly and steadily make audience recognize you. This will increase your popularity and business as you will be a more familiar face to the targeted audience. Lower Cost Per Conversion - Remarketing ads can often deliver a lower cost per click (CPC), and hence a better cost per conversion compared to any of the traditional search campaigns. This is dependent on the industry competitiveness, but remarketing campaigns work better than search campaigns since it is tailored to users. Some of the remarketing audience is sourced from search campaigns though it is counter-productive without a decent amount of traffic to the website from diverse sources. Highly Targeted Ad Text - By targeting visitors of your website, you can create relevant ad text that attracts them back to the website for purchases or browse through some interesting info. Devise different ads for different pages, people have usually visited. With specific ads based on the type of page and its topic, the targeted audience will be immediately interested. Remarketing helps you promote new offers, discounts, of a product or service. Remarketing allows you to market one kind of product in different styles, based on the choices of the audience. It has the capacity to draw newer audiences to you while keeping the old ones engaged. It allows brands to be able to connect with their audience personally and builds healthy communication between the two. Prateeksha Mathur is a tech-savvy marketing professional writing for Zestard Technologies, who loves to write about digital marketing, web design, web development and other technology spheres. She is a coffee addict and a bibliophile too. You can follow her on Twitter.